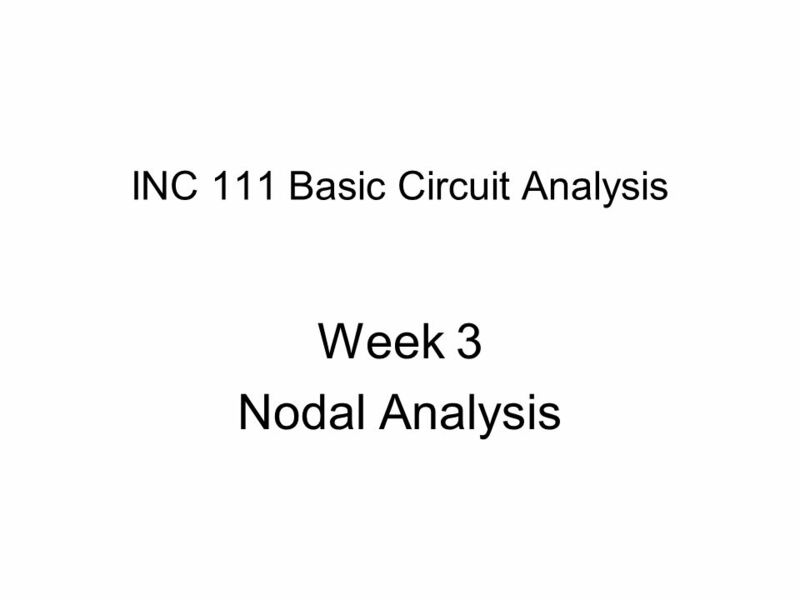 INC 111 Basic Circuit Analysis Week 3 Nodal Analysis. 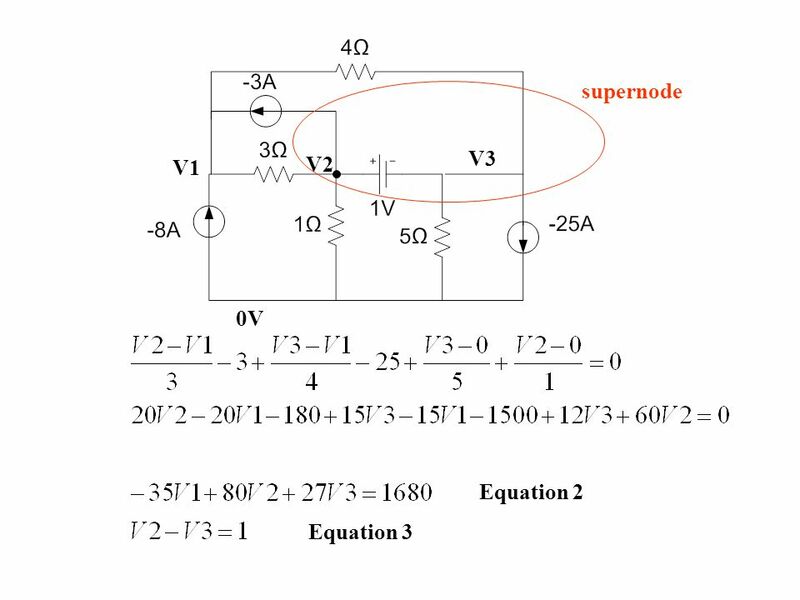 16 Supernode When there is a voltage source in the circuit, direct KCL cannot be used because we do not know the current in the voltage source. 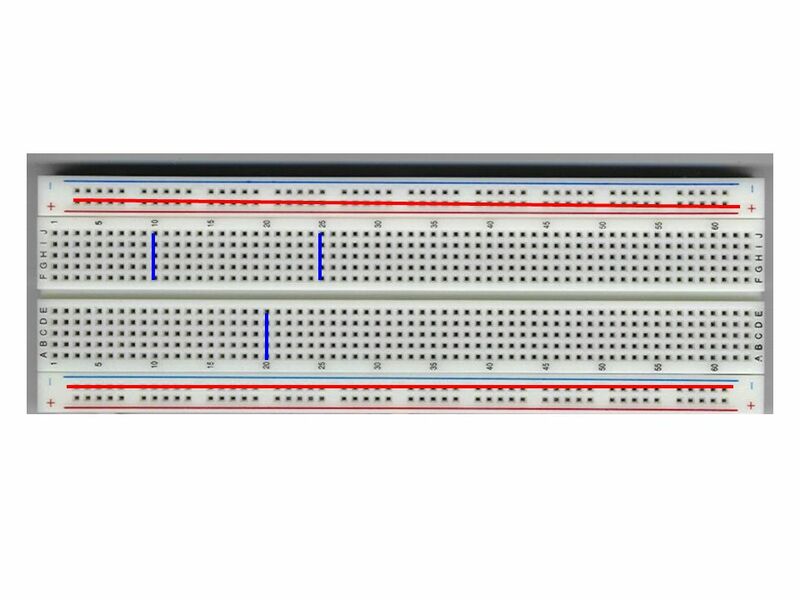 We will use the idea of supernode. 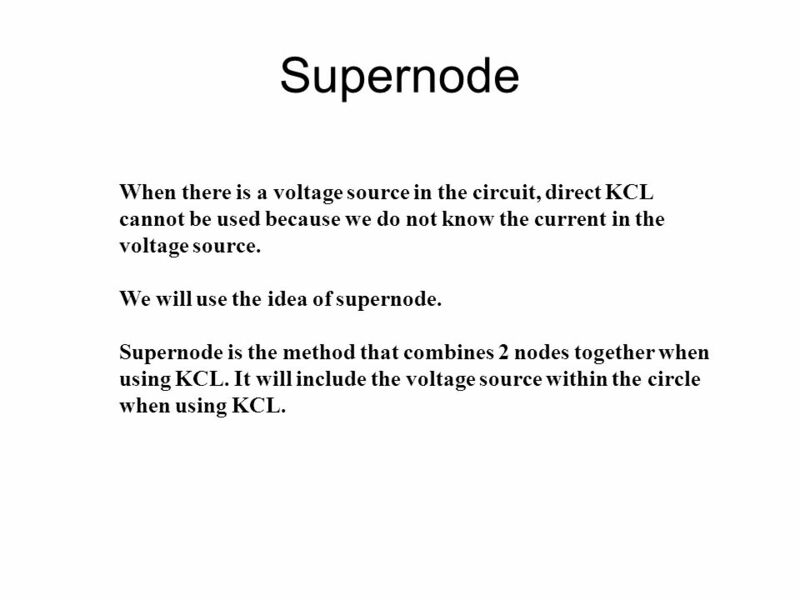 Supernode is the method that combines 2 nodes together when using KCL. 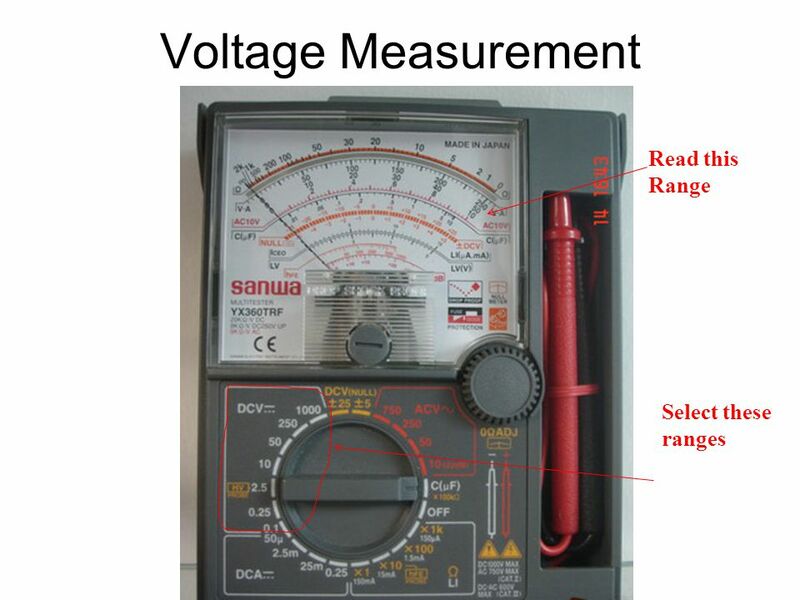 It will include the voltage source within the circle when using KCL. 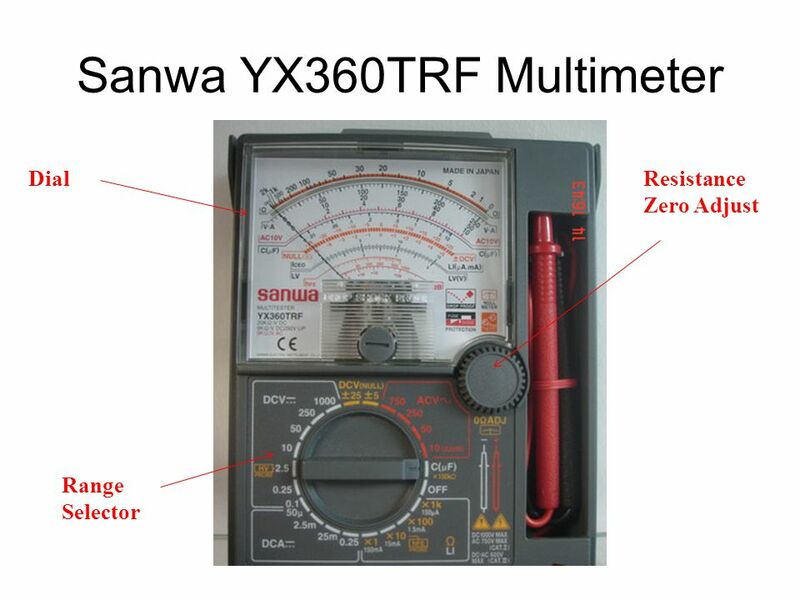 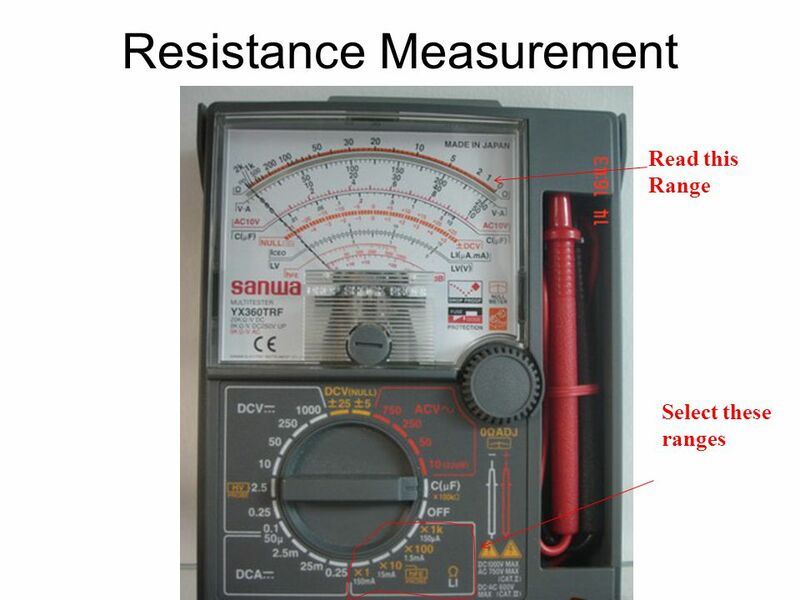 27 Measure the Resistance of Ammeter and Voltmeter Adjust a multimeter to measure volt and use another multimeter to measure its resistance. 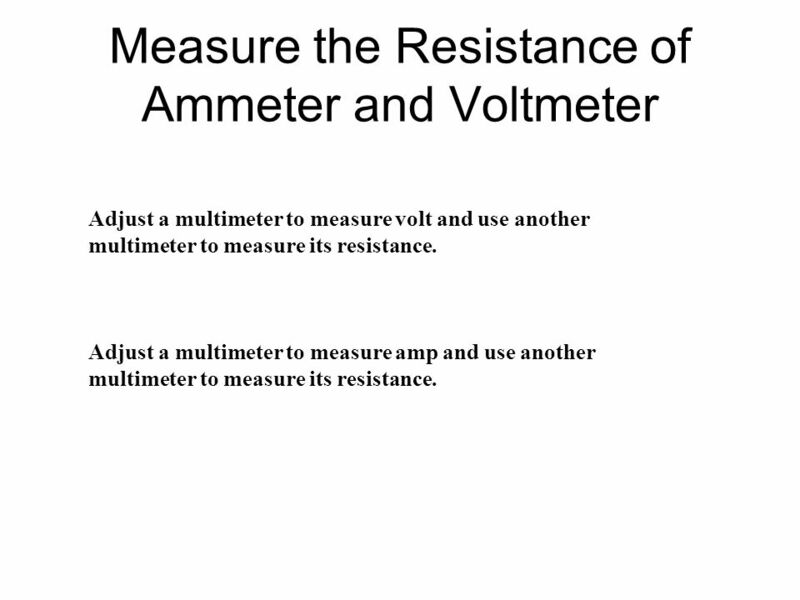 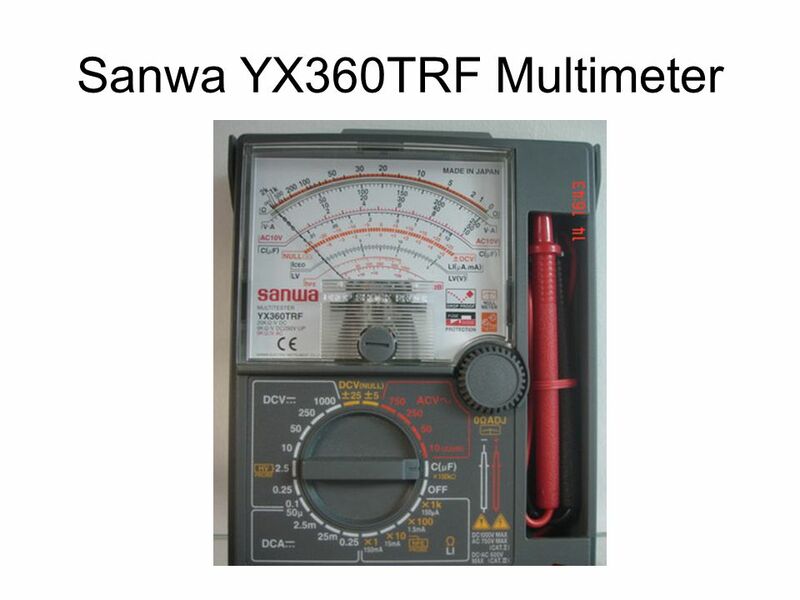 Adjust a multimeter to measure amp and use another multimeter to measure its resistance. 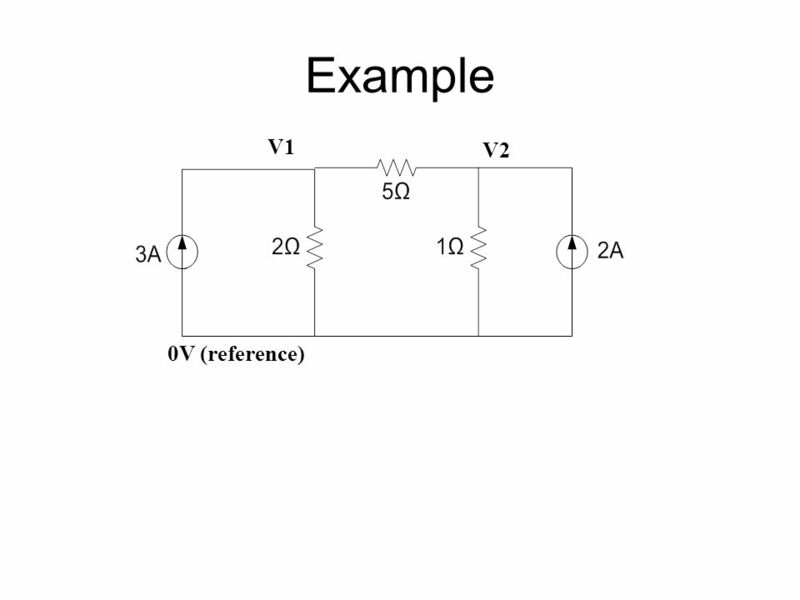 Download ppt "INC 111 Basic Circuit Analysis Week 3 Nodal Analysis." 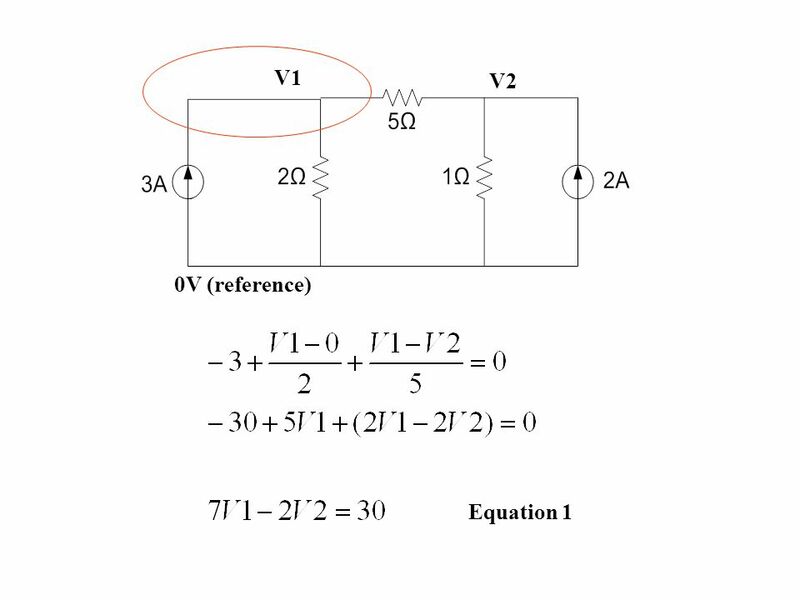 Chapter 7 Series-Parallel Circuits. 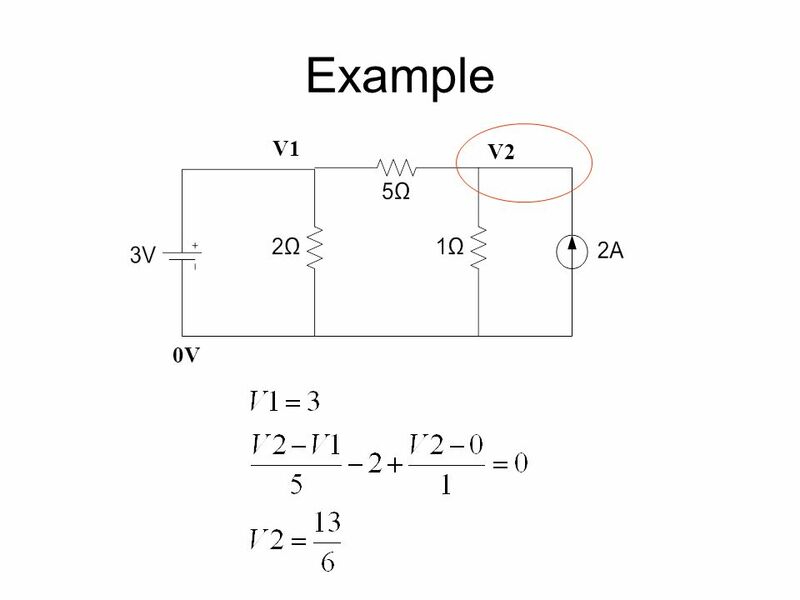 Objectives Analyze series-parallel circuits Analyze loaded voltage dividers Analyze ladder networks Analyze a Wheatstone. 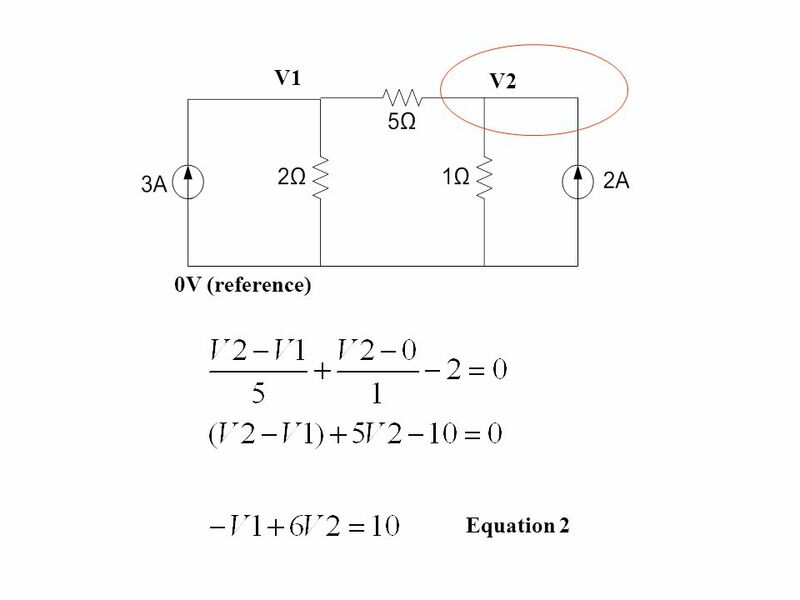 1 ECE 221 Electric Circuit Analysis I Chapter 8 Example 4.3, Problem 4.11 Node-Voltage Method Herbert G. Mayer, PSU Status 1/19/2015. 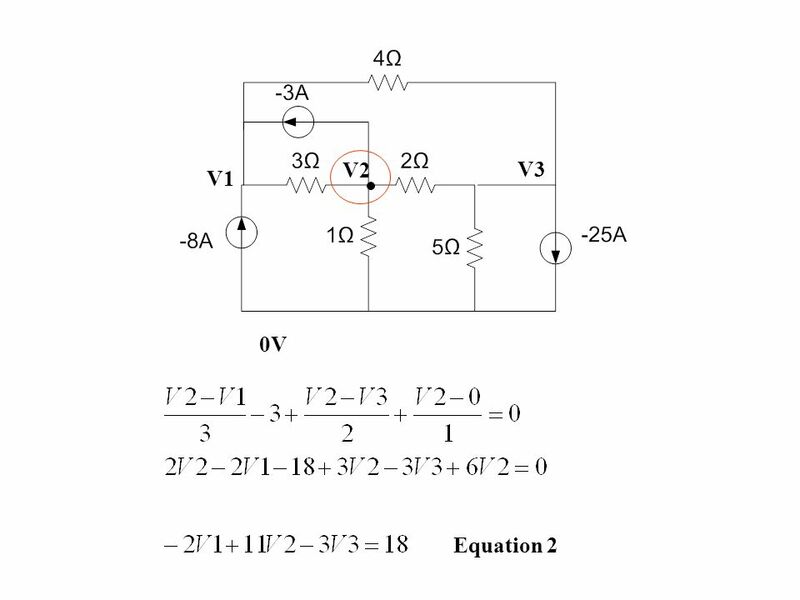 1 ECE 221 Electric Circuit Analysis I Chapter 5 Branch Currents Herbert G. Mayer, PSU Status 1/5/2015. 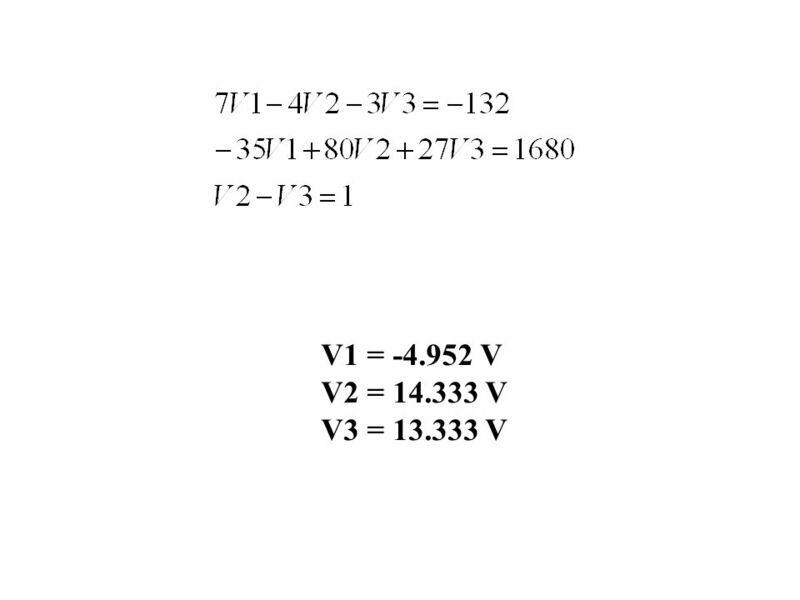 Network Theorems. 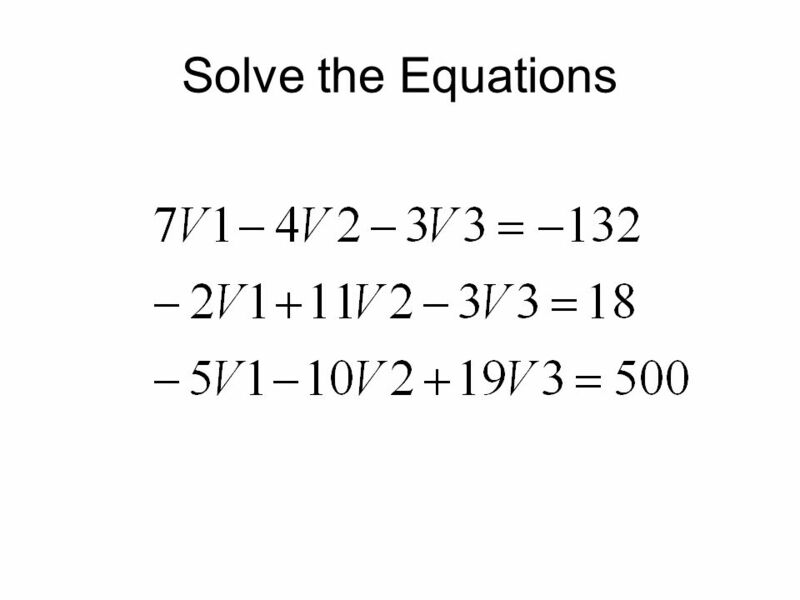 Mesh analysis Nodal analysis Superposition Thevenin’s Theorem Norton’s Theorem Delta-star transformation. 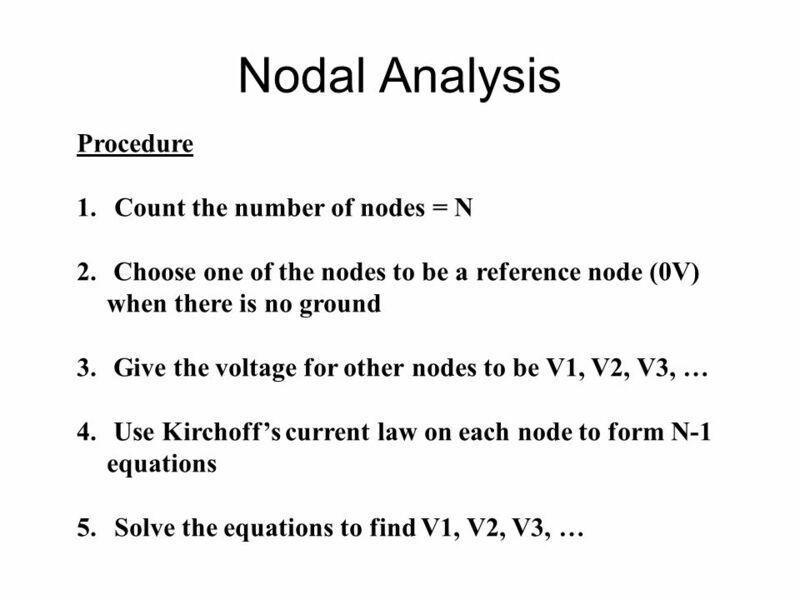 Nodes and reference nodes Steps of Nodal Analysis Supernodes Examples Lecture 5. 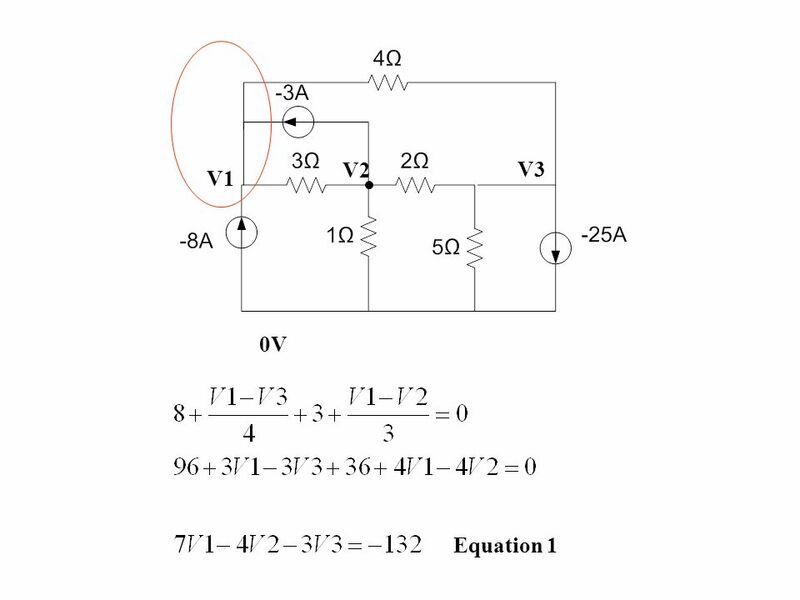 Nodal Analysis 1. 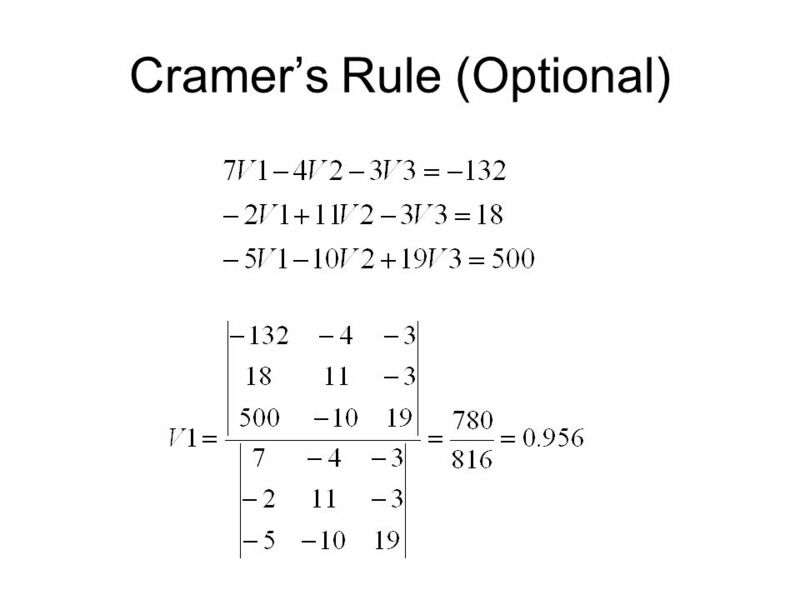 Lecture 6 Nodal Analysis Section Jack Ou, Ph.D.
LectR1EEE 2021 Exam #1 Review Dr. Holbert February 18, 2008. 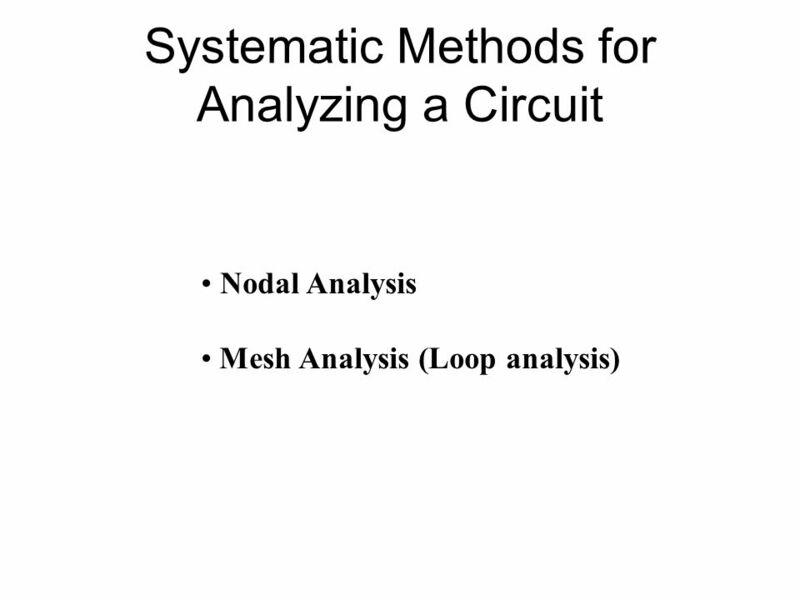 METHODS OF ANALYSIS Mesh Analysis Nodal analysis. 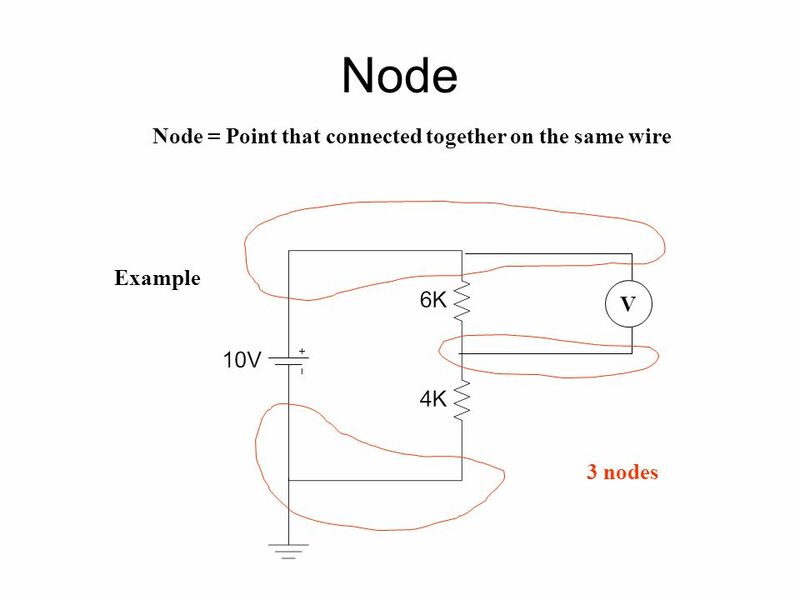 Lecture 21 EEE 302 Electrical Networks II Dr. Keith E. Holbert Summer 2001. 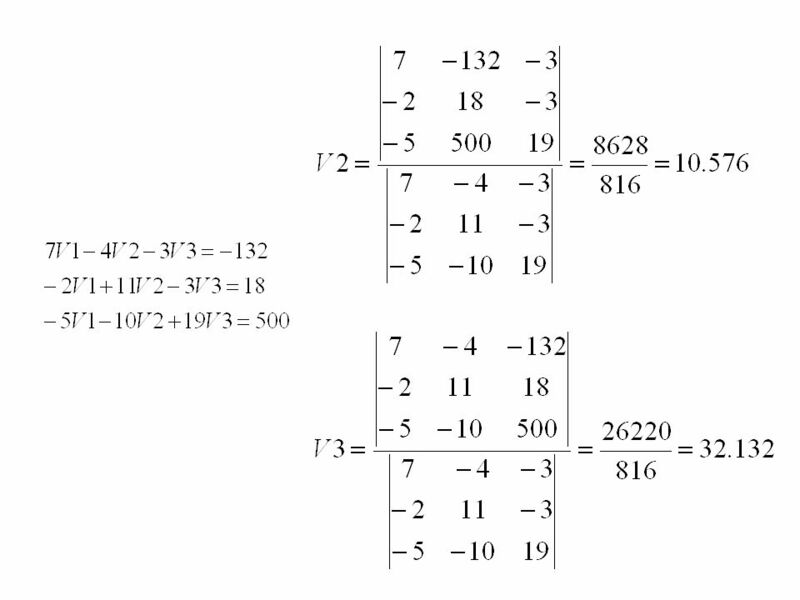 Lecture 71 Nodal Analysis (3.1) Prof. Phillips February 7, 2003. 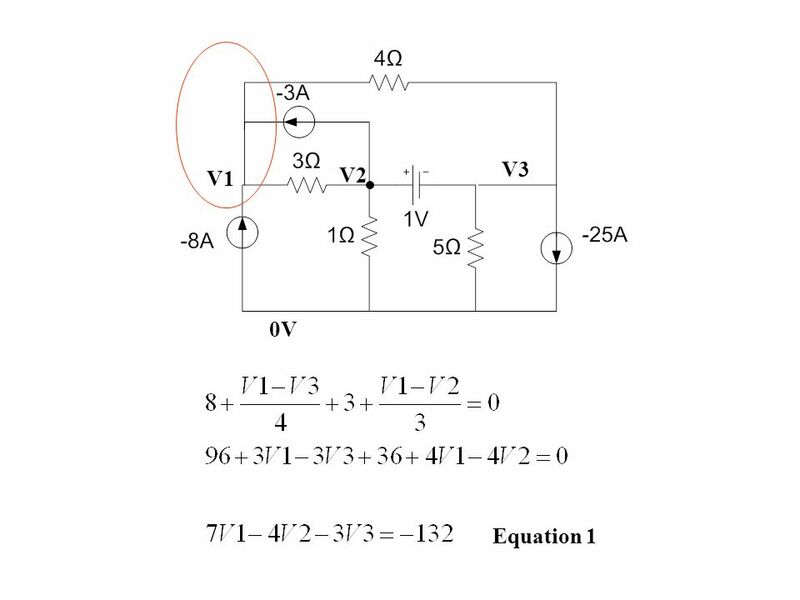 Lecture 261 Nodal Analysis. 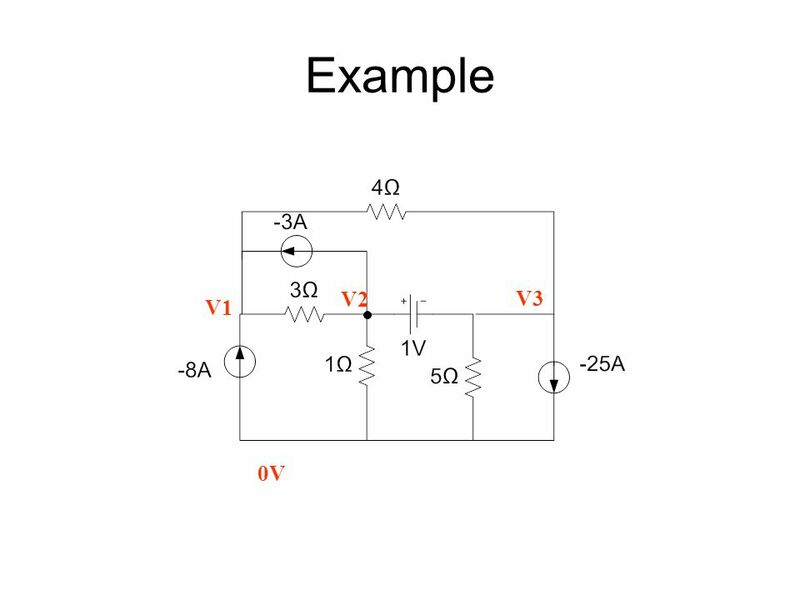 Lecture 262 Example: A Summing Circuit The output voltage V of this circuit is proportional to the sum of the two input currents. 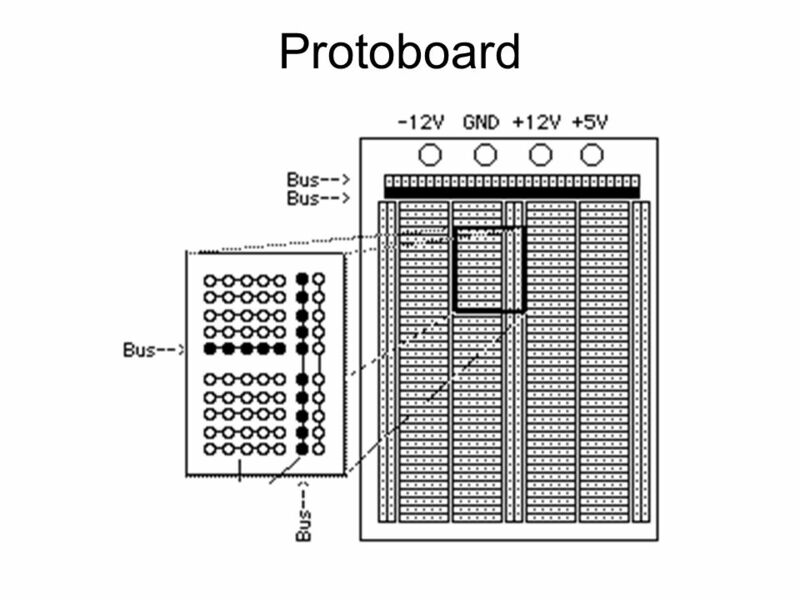 ECE201 Lect-91 Nodal Analysis (3.1) Dr. Holbert February 22, 2006. 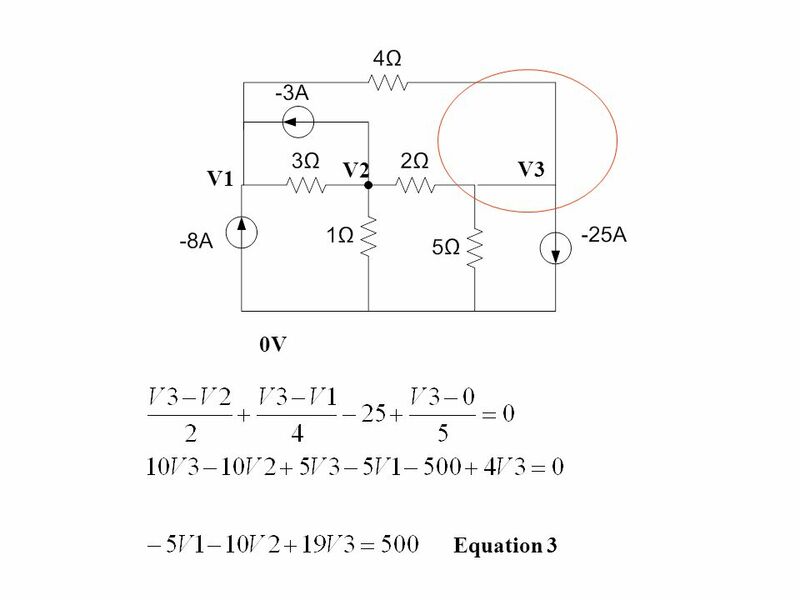 Week2bEECS 42, Spring 2005Prof. 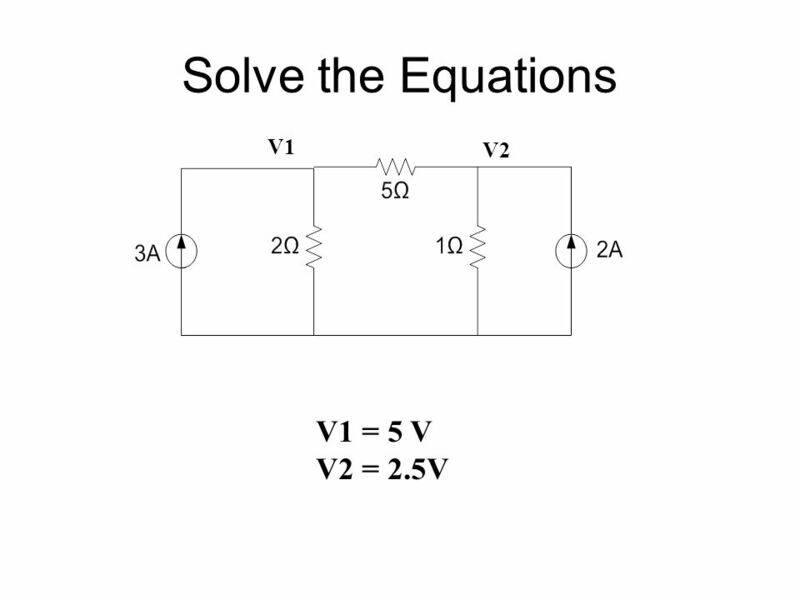 White Find i 2, i 1 and i o Circuit w/ Dependent Source Example. Lecture 5 So far, we have been applying KVL and KCL “as needed” to find voltages and currents in a circuit. Good for developing intuition, finding things. 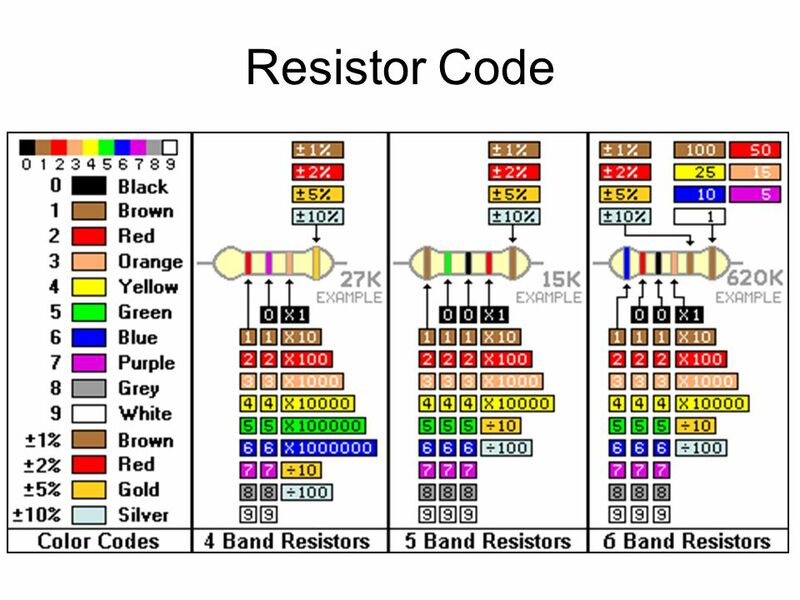 Lecture 4, Slide 1EE 40 Fall 2004Prof. 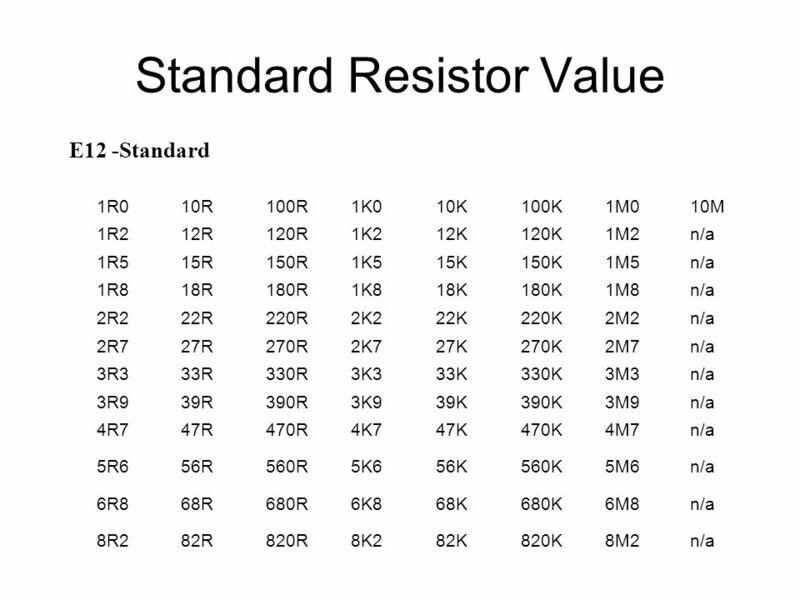 White Lecture #4 OUTLINE Resistors in series –equivalent resistance –voltage-divider circuit –measuring current.